Hand-knotted Persian Mahi-Tabriz Rug made in India. Silk and Wool Pile. 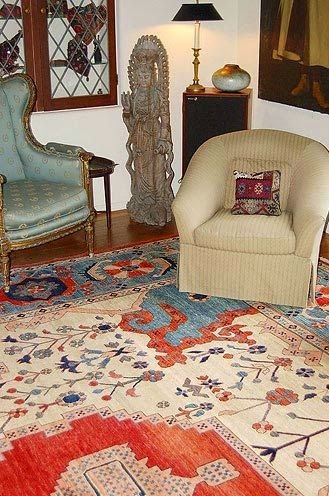 Our customers, who recently moved into their home in Doylestown, were delighted to find on their first visit to Brandon Oriental Rugs the exact rug they needed to work with, and unite, their existing furnishings and new paint colors. They were also delighted to find that by using Brandon's service, they were able to get their rug delivered and installed with padding at a price that saved them several hundred dollars compared the price of a similar rug at one of the largest internet "rug sale" websites. If you are comfortable without it, the rule-book has been tossed. You decide where the definition is needed and what meaning is intended. Derring-do: try it; if it looks great, who will question your boldness? 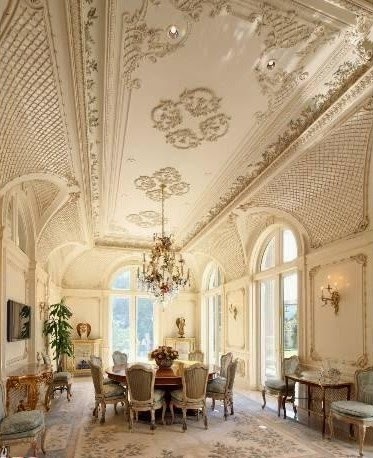 The hunger for real oriental rugs, like any appetite, can't be satisfied with one taste once the craving for a feast takes hold. 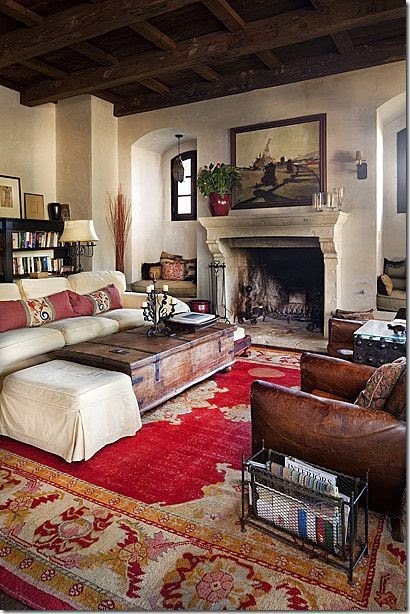 A real hand-knotted oriental rug is always ready to serve as base camp for exotic adventures at home. The aspiration for and recognition of QUALITY is built into you; and can be found from the rug under your feet all the way up to the thoughts dreamt in your mind. The objects we possess, or choose to have in our environment, reflect who we are. 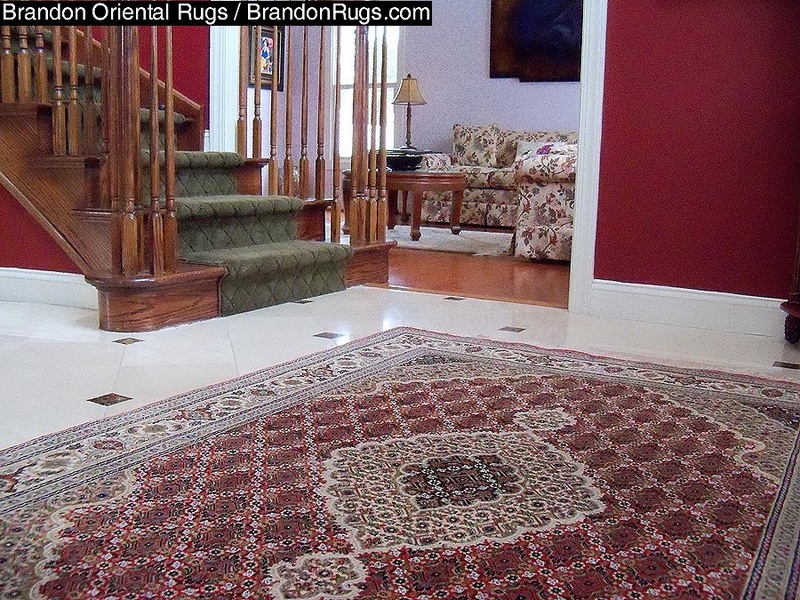 Available Rugs from Brandon Oriental Rugs selected to help our customers in Bucks County, PA and Princeton, NJ with recent home design and renovation projects. Less than a week after leaving the Middle East without securing a cease-fire, John Kerry indulged in a little retail therapy while on an official visit to India. 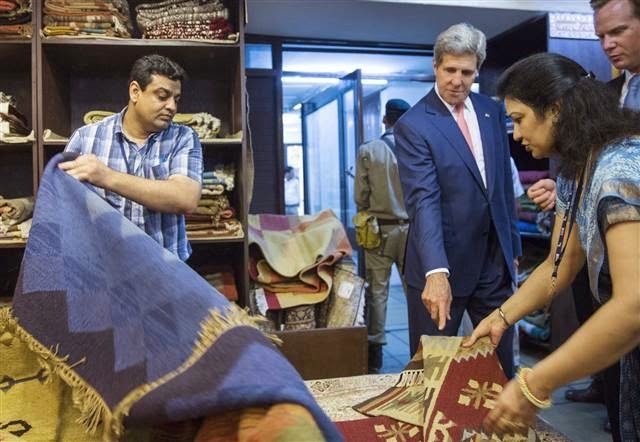 The Secretary of State purchased three rugs while touring a market in New Delhi ahead of trade talks. Kerry ...was guided through the first floor of the Central Cottage Industries Emporium where goods on sale included sandalwood carvings, miniature rice art and painted marble. 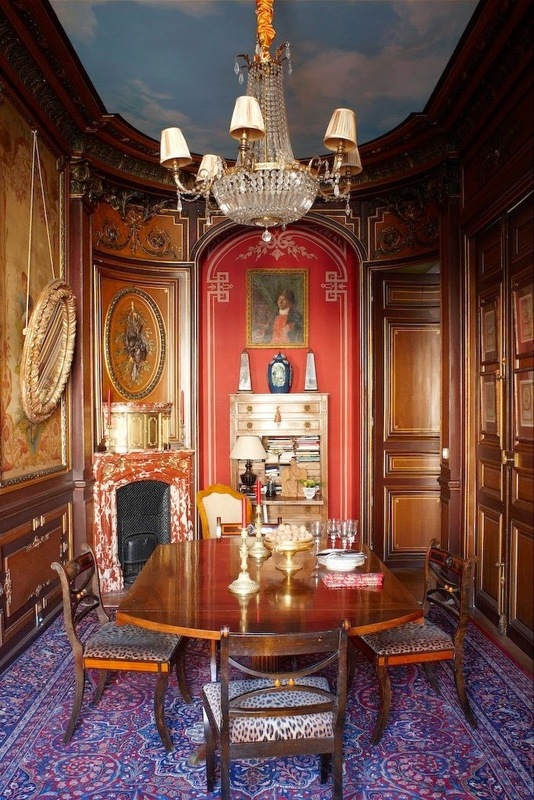 On the second floor he found a rug store whose proprietor showed him silk rugs as well as wool. 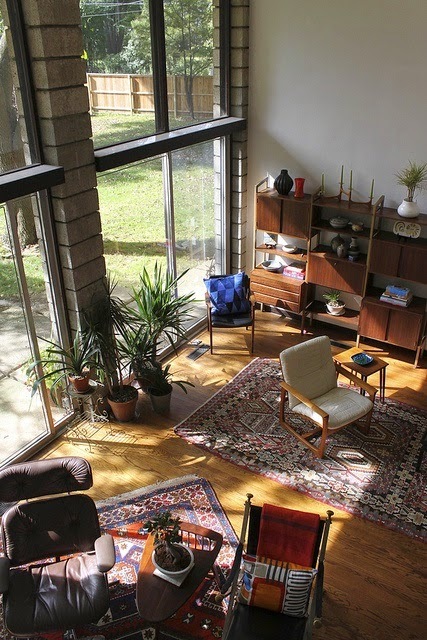 After much admiration of several different items, Kerry opted to purchase three dhurrie rugs including one from the Kashmir region. The Secretary of State arrived India, hopeful of persuading leaders there to sign a World Trade Organization deal that would liberalize global commerce. [Comment: Over the last twenty years much has been made (and rightly so) of the issue of child labor in the production of oriental rugs. Much has been done by cooperative efforts of the rug producing nations, rug manufacturers, and humanitarian organizations to correct the problem wherever it is found in the industry.